Don’t let the word pineapple throw you off from making these absolutely delicious bbq ribs! 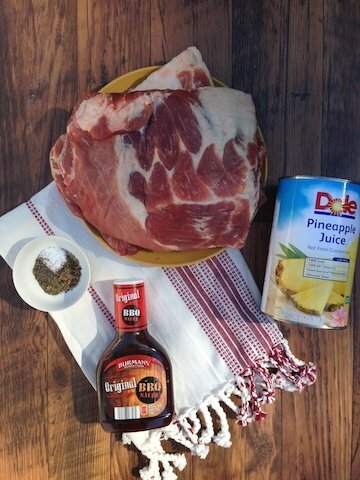 You won’t even taste the pineapple in this dish after it bakes, but what a difference it makes in the meat! 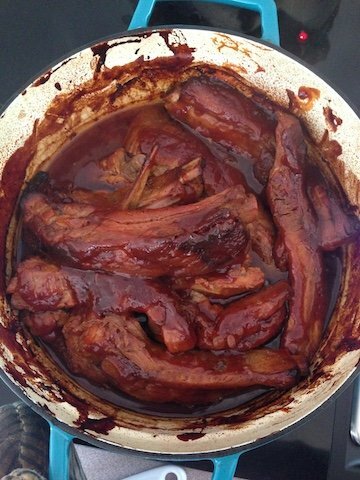 These Pineapple BBQ Ribs were a hit at a wedding…And the woman who catered the wedding happens to be a close friend of my mom. She shared the recipe of these tender ribs with my mother and here I am sharing it with you today. This recipe is so fast to prep as you’re literally tossing a few ingredients together in the same pot and letting them do their thing while baking. I have made bbq ribs various times but this is my ultimate favorite, not to mention how nice your house will smell while these bake away. 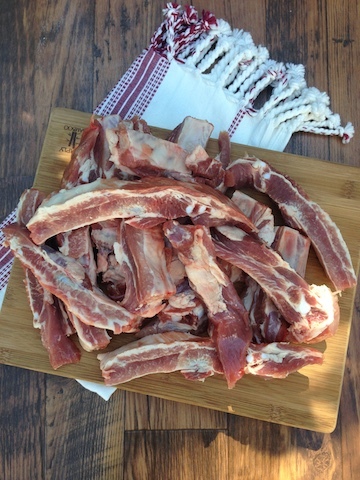 I use big pork spare ribs for this recipe and I kid you not these come out so tender and juicy you probably wouldn’t have guessed what kind of meat it was. The flavors meld in all so well and not only creates tender ribs but leaves an aroma that will boast up your appetite in no time. Serve these with Whipped Cream Cheese & Sour Cream Mashed Potatoes to complete your meal. A must try! Preheat oven to 400 degrees F. Slice ribs between the bones to separate. Set aside. In a heavy cast iron pot (with a lid) combine the pineapple juice, bbq sauce (any bbq sauce will do but preferably an original version) and dry seasonings. 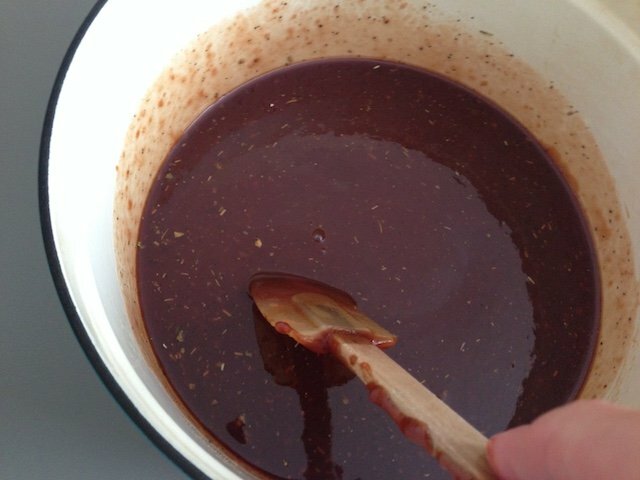 Stir everything with a spatula until well incorporated and smooth. 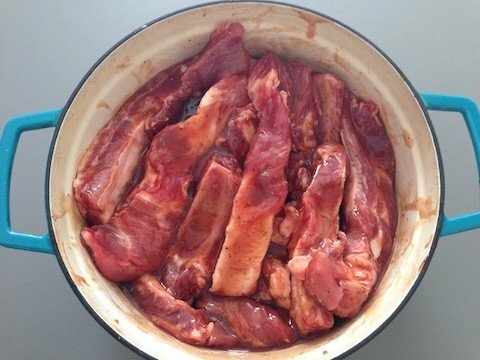 Add spare ribs to the cast iron and toss ribs in the sauce. Cover and bake at 400 degrees F for 1 hour then reduce heat to 325 degrees F and bake for 1 more hour. After ribs have baked for 2 hours remove and baste ribs with some sauce, place back in the oven uncovered and continue to bake for 15 min. Turn off oven and cover cast iron with a lid. Keep warm until you serve. Let meat rest before serving. Cover and bake at 400 degrees F for 1 hour then reduce heat to 325 degrees F and bake for 1 more hour. After ribs have baked for 2 hours remove and baste ribs with some sauce, place back in the oven uncovered and continue to bake for 15 min. Turn off oven and cover cast iron with a lid. Keep warm until you serve. Let meat rest before serving. If I dont use the dry seasonings does it change the flavor? Hi Anna, you could probably omit the dry seasonings because the juice and bbq sauce should have tons of flavor on there own so I think you’ll be fine without them. But if you do use them you should not be over powered by the herbs, they blend into the sauce. This looks delicious and I cant want to make it! Can it be made in a glass pan instead of the iron pot? Thanks! This looks delicious and cant wait to try it! Would it be okay if it was baked in a glass pan instead? Or does it have to be in the cast oven? Thanks! You could just try to cover the dish with aluminum foil during the baking process and if you want you can try to bake uncovered towards the end to glaze/baste the ribs.